Good Morning Snore Solution and SnoreRX use two different methods to stop you from snoring. 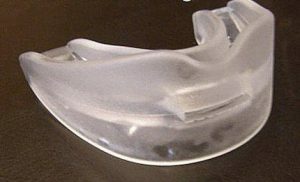 Good Morning Snore Solution is a TRD (tongue retaining device) and the SnoreRX is a MAD (mandibular advancement device). Both devices stopped my wife and me from snoring. The ease of fitting and cleaning the Good Morning Snore Solution made it our favorite of the two, though some people may prefer SnoreRX depending on their preferences. It took a while for our tongues to feel normal wearing the Good Morning Snore Solution. 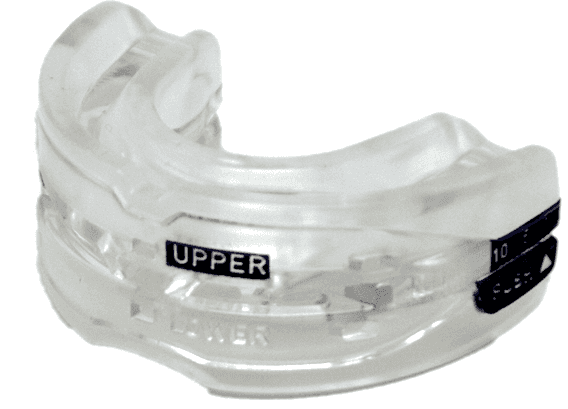 The flex jaw customization feature of the SnoreRX made it easier for us initially to adjust to wearing it. Good Morning Snore Solution has an odd-looking shape compared to other anti-snoring devices. This is because, as a TRD, it doesn’t need to conform to your mouth. There is a small suction bulb that you attach to the tip of your tongue. You squeeze the bulb and the suction keeps it in place on your tongue. By keeping your tongue from falling back into your throat when you sleep, it stops you from snoring. Dropping it into a denture solution easily cleans it. We bought two of the devices. They arrived within a few days. After being used to boil and fit and adjusting MADs, the TRD was simple to use. We simply squeezed the bulb and it attached to the tip of our tongue. Admittedly, my wife and I felt a little strange wearing it and both got a case of the giggles placing it on the tip of our tongues. I was amazed the next morning to find that it had not fallen off. My wife and I awoke refreshed and our son reported no sounds of snoring coming from the bedroom the previous night. My tongue, however, was pretty sore. The next night I tried not to squeeze so hard and used less suction. This seemed to help as after the second night my tongue was not quite as sore. By the fourth night, the soreness had gone away. One thing that could be an issue for some people: you have to breathe through your nose when wearing the Good Morning Snore Solution. Unlike most MADs, there are no air holes that would allow you to breathe through your mouth too. The look of the SnoreRX differs quite a lot from that of other MADs. It looks a bit complicated due to its sophisticated technology compared to other mandibular advancement devices. You can get an excellent, custom fit with the SnoreRX. You can use the boil and bite process and then adjust the calibrator to ensure the perfect fit. The calibrator has ten different settings, 1 mm apart. It took me and my wife a while to get the SnoreRX fitted as the number of options overwhelmed us a bit. We used the boil and bite first and then used the calibrator function to try and customize it to our mouths. The time it took was worth it as the next morning my wife reported no soreness. I needed to adjust mine slightly but after the second night, the mouthpiece caused me no discomfort whatsoever. My wife and I slept well and neither of us reported hearing the other snoring. The cleaning process took more time than expected. You cannot just drop the device in a glass of warm water with a cleaning tablet and forget about it. The design included lots of little hard-to-reach spots that required scrubbing with a tooth brush to remove any possible bacteria. My wife and I agree that the SnoreRX does as it advertises. We both had a great night sleep and it stopped us from snoring. Both of these devices kept us from snoring. The Good Morning Snore Solution, with no boil and fit or adjustments necessary, the simplicity of wearing it and the ease of cleaning, makes it my wife and I’s favorite. Note: Ordering two of either the Good Morning Snore Solution or the SnoreRX cuts the price by more than one-third. Make sure to use a Good Morning Snore Solution Coupon or SnoreRX Coupon if you decide to order.